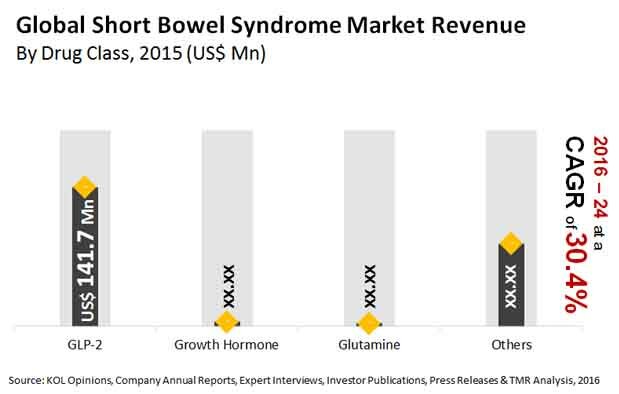 The global short bowel syndrome market is consolidated. Shire Plc. held 50% of the market in 2015. Strategic acquisitions have become a strategy for key players. The players are also focused on marketing over-the-counter dietary supplements over-the-counter dietary supplements as well as manufacturing these supplements. Companies are also focusing on developing Innovative Therapies which Focus majorly on gastrointestinal diseases, states Transparency Market Research in its latest research on the global short bowel syndrome market. Names of the key players operating in the market are: Shire plc, Emmaus Life Sciences, Inc., Merck KGaA, and Nutrinia Ltd, OxThera, GlyPharma Therapeutics, Ardelyx, Inc., Sancilio & Company, Inc., Zealand Pharma A/S, and Naia Pharmaceuticals. According to the research report, the global short bowel syndrome (SBS) market is expected to be worth US$2.6 bn by the end of 2024 and expand at a whopping CAGR of 30.4%. in the period from 2016 to 2024. On the basis of geography, North America is expected to exhibit at 32.7% CAGR from 2016 to 2024 and lead in the short bowel syndrome Market. In terms of drug class, the global short bowel syndrome market is expected to be led by the GLP-2 drug leaving behind glutamine and growth hormones. The GLP-2 drug is expected to expand at a whopping 36% CAGR between 2016 and 2024. This drug is sold both in the US and in the Europe under the brand name Gattex and Revestive respectively. Due to its exclusivity, GLP-2 drug is anticipated to contribute considerably to the revenues of the short bowel syndrome market worldwide. According to the lead author of this report, parenteral nutrition is extremely costly and is administered to the patient which allows into steins to maintain homeostasis and adapts to the changes and this unaffordability of parenteral nutrition will bolster the demand for short bowel syndrome drugs which reduce the patient's dependence on parenteral nutrition. The growing incidences of short bowel syndrome is expected to drive the growth of this market. The additional assistance offered to patients suffering from short bowel syndrome through Gattex is also aiding the growth of the market. The increase in consumption of unhealthy and junk food, sedentary lifestyle, and busy lifestyle with no time to focus on nutritious and healthy food are some of the other factors that will help this market to grow further. However, there are many challenges which this Market face, one of them being the Rarity of this disease on account of which the diagnosis rate is relatively low. In addition to this, the approved drugs of short bowel syndrome is not available easily all across the world. However, this also results in a significant pool of patients with unmet medical needs which will create a potential for growth in future. Another factor drive the growth prospects of this Market is increasing focus and investment by several foundations and associations in creating a heightened awareness level about short bowel syndrome. As of now, the National Organization for rare disorders along with its member organizations such as the Oley Foundation, the short bowel syndrome Foundation, the Association of gastrointestinal motility, and the SBS Cure Project are creating awareness about short bowel syndrome among the people. Apart from these organizations, drug manufacturers are also raising awareness programs all these factors are helping the market to grow. A key factor which is expected to restrict the growth of this Market is the side effects of taking drugs that help in the treatment of short bowel syndrome. The most common effects on the health by Revestive or Gattex include cold, nausea, flu, abdominal pain, and headaches. In addition to this it has been found that these medicines can further cause complications in the body such as blockage of the bowel, abnormal cell growth which could for the lead to cancer, polyps in the colon, and inflammation of the gallbladder or blockage of the pancreas. Another challenge which is facing the market is the non-availability of the approved drugs in developing nations especially.